What is the Best Way to Stay Healthy through Pregnancy? a. Chiropractic adjustments allow our master control system, our nervous system, to function properly. Since mom shares a nervous system with baby, this is imperative for mom to be healthy, and for proper growth and development of your little one! b. Chiropractic adjustments (utilizing the Webster technique) allow for the hips and soft tissue structures to balance so that the baby receives proper nerve flow, and so baby can naturally go into the best position possible for birth. This also leads to a shorter, less painful, and more straightforward delivery both for mom and baby! Who doesn’t want that?? c. Mom’s body is constantly changing throughout pregnancy and chiropractic care allows mom to adapt to these changes. This leads to a MUCH more comfortable and pain free pregnancy! 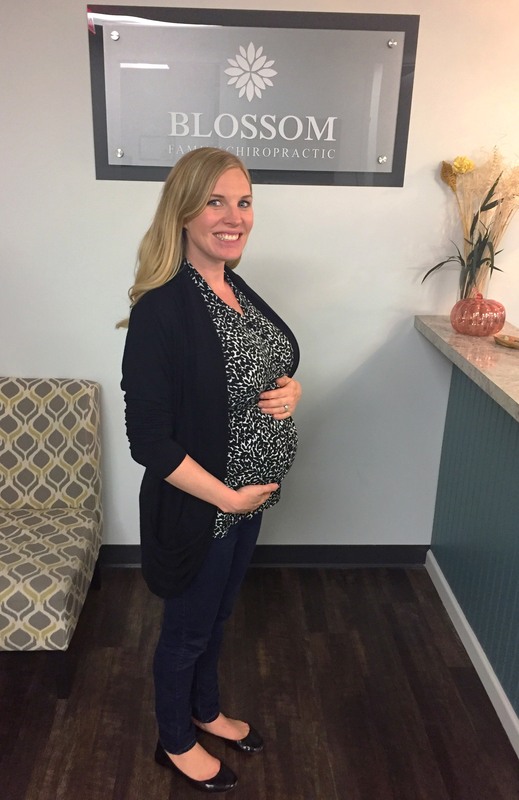 2) Massage: My career as a chiropractor is extremely physical and I have to keep up with its demands (in addition to the increased physical demands of pregnancy). In order to keep my body functioning optimally and reduce overall stress, I get 2 prenatal massages each month. This not only promotes overall wellness but helps to improve circulation, reduce muscle tension, and relieves physical stress placed on various joints. 3) Acupuncture: Acupuncture helps to regulate hormones which can not only help with infertility (prior to conception), but can also minimize typical pregnancy symptoms including heartburn, nausea, or overall stress. In addition, towards the end of pregnancy, different acupuncture points can be used to promote labor and get things moving! I get acupuncture treatments every 4 weeks to keep my hormones in check. 4) Proper Nutrition: In addition to eating clean whole foods, I take a daily whole food based prenatal vitamin. There are several that are wonderful choices, however, I personally use Innate Choice Baby and Me Prenatal vitamin. A whole food based prenatal is able to be absorbed and readily used by the body for nutrients. Furthermore, I would suggest having blood work done throughout the pregnancy so that you can see if you deficient in any nutrients or vitamins and find a high quality supplement to help with those deficiencies. 5) Regular Movement: Whether this is a prenatal yoga class, a long walk on the beach, or a swim, movement is key to keeping your body in optimal shape during pregnancy. Stay away from high intensity workouts and find a low impact exercise that you enjoy doing to keep your body moving! I do some sort of exercise/movement each day to keep my body in shape! https://blossomfamilychiropractic.com/wp-content/uploads/2017/11/IMG_8633.jpg 3240 2102 Savy Irby https://blossomfamilychiropractic.com/wp-content/uploads/2019/01/blossom-logo-grey-l-1030x216.png Savy Irby2017-11-02 23:07:492017-11-06 13:52:41What is the Best Way to Stay Healthy through Pregnancy?